Rabbi Cahn continues to give us more of the same. With Cahn, everything is always a “mystery” that he has apparently been fortunate enough to be able to finally unravel and reveal. His first was The Harbinger, a fictional account of the alleged connection between the United States and Israel. Since then, Cahn has given us The Mystery of the Shemitah and a number of others. They all portend to reveal things about America’s interconnection with Israel. In fact, Cahn is quite liberal in applying passages of Scripture that are directed solely at Israel to the United States. I’ve written several articles critiquing Jonathan Cahn’s books and theology (as have others), and you can read them at this link: Jonathan Cahn articles. The unfortunate aspect of Jonathan Cahn’s books is that even though he’s wrong time and time again, people continue to purchase his books, likely because they don’t want to risk missing the time when he might be correct. Cahn always gives himself an out regarding the things he writes about. They are dependent to some degree on how people respond to them, so in that sense, they may or may not come to pass. Numerous individuals today who purport to reveal God’s secrets do much the same thing, so they’re never really wrong even when they’re wrong. 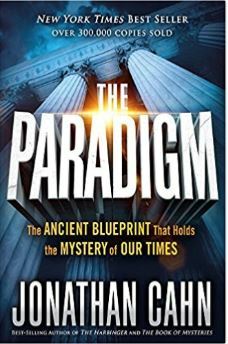 In The Paradigm, Jonathan Cahn is essentially doing the same thing he did in The Harbinger and The Mystery of the Shemitah though the setting is different and based more on historical information. In Paradigm, Cahn tries to establish this idea that a “model” has existed since before time and that model provides the answers for everything (my paraphrase). This reminds me of any book written by Dan Brown (The DaVinci Code). People love this type of thing, where a fantastical narrative is interwoven throughout a book designed to bring people to and keep them on the edge of their seats. Who doesn’t like a mystery? Moreover, when a person is let in on the secret of that mystery, that makes it even more exciting. If you substitute the word “Bible” with the phrases, “master blueprint,” “ancient paradigm,” and “mystery,” there is certainly more truth than what Cahn espouses in his latest literary effort. It is the Bible – God’s Word – that has provided humanity with the “blueprint” that directs the steps of this world. It is all moving according to God’s plan and purposes and for His glory. People seem far more interested in discerning “secrets,” than simply being obedient to God and His will. In this latest book, I believe Jonathan Cahn continues to get it wrong, though it will certainly not seem that way to many. The truth is that there is no connection between Israel and America. None. Yet, for those caught up into some aspect of the Dominionist movement, they will continue to make that connection. While God allowed the USA to come into existence, He specifically created Israel for His salvific purposes. God specifically set out and chose Israel (with Abraham, Isaac, and Jacob as its “root-ball” so to speak; cf. Romans 9-11), to bring forth a Savior in Jesus who would become the sacrificial Lamb that provides salvation for all who will come to Him in faith, believing that He is God the Son, who bore our sins so that we do not have to suffer the consequences of those sins. Expressing our faith in His redemptive work on our behalf grants us salvation or eternal life. Through it, we are sealed with the Holy Spirit and enter into relationship with Jesus, God the Son. This was one of the main purposes of Israel, though there are other godly purposes as well. However, Israel has consistently failed to live up to those purposes one generation after another. Yet, God will be vindicated one day through Israel and all of His originally intended purposes will come to pass. What is said of Israel cannot be said of the United States of America or any other country, even though there were numerous countries (or “empires”) throughout history whose leaders and armies were expressly used by God to bring judgment to Israel during their repeated times of idolatry and rebellion against God. This will occur in the future as well as we read throughout Ezekiel, Daniel, Revelation, and other portions of God’s Word. It would be far easier, more accurate (but certainly far less exciting), if Jonathan Cahn wrote a book that pointed to the fact that God, through the Bible, is the basis for what has transpired in world history since the beginning and will take us to the climax of human history when Jesus returns. That’s already written down in the Bible and fewer and fewer Christians seem to want to read it for study or devotional purposes. Too many within Christendom today are looking for ethereal, spiritual experiences from many other sources. I am again reminded of my time spent within the Charismatic Movement years ago, as I’ve written about previously. It was far more exciting to seek after those who had a “word of knowledge” or who could tell us of the “new” things God was doing, than simply reading His Word. If you go to Amazon’s page where The Paradigm is highlighted, you’ll see that there are 337 reviews (as of this writing); most of them five stars. Phrases like the following are used in describing the reading experience. The essence of the book is probably best summed up in one reviewer’s comment: America’s idol worship leads to apostate epidemic! Cahn’s whole purpose in writing Paradigm is to connect America’s coming downfall with Israel’s. As Israel went, so goes America if we follow the same path as Israel did. Basically, as Israel sinned and suffered the consequences, so will America. The big problem though is that, as far as I can discern from Scriptures, the only country that God deals with as though it was one entity is Israel. Israel is at times, referred to as the wife of Jehovah. God literally says He is married to Israel (Jeremiah 3:14). God also calls Israel “Sodom” and a “harlot” at times as well (Jeremiah 3:1). God has never been “married” to the USA. If there is any entity that shares commonalities with Israel, it would be with the Church in the sense that God sees the Church as Christ’s Bride, much the way He sees the nation of Israel as the wife of Jehovah. It is important to remember that where Israel is concerned, the entire nation is dealt with by God according to their works. This does not mean by the way, that Israelites had to work for salvation as this was never the case. God always judged them by the condition of their hearts, which is why some were considered “righteous” because of the faith they exercised in God (Hebrews 11). Their works stemmed from the condition of their righteous heart. They wanted to please God and so they did unlike the Pharisees who were merely legalists, all for outward show. But even those considered righteous within the nation of Israel still had to deal with God’s righteous judgment on the entire nation. Daniel, his friends, Shadrach, Meshach, and Abednego, along with many others whom God likely considered righteous based on their faith in Him, were still evicted from Jerusalem by Nebuchadnezzar (and other rulers later on). It was the nation that God judged because of what Israel’s religious and political leaders did that caused such an affront to God. It is also helpful to remember that Israel was created as a Theocracy, with God as its ultimate ruler. Even though the people wanted a human king to sit on the throne (like their neighboring countries/empires; which was a lack of faith in God’s ability to keep them secure though He had proved it over and over), Israel was still a Theocracy because the king would still answer to God (King of kings), as did the priests and High Priest. The United States of America was never intended to be a Theocracy. America did not start out even as a monarchy with a king. The United States of America is a Constitutional Republic (not a Democracy, though we use the democratic process to elect public officials). This being said, is it possible that America will at some point fall? Yes, it is very likely that this will happen. In fact, it’s probable because of what the Scriptures reveal about the End Times/Last Days. The Antichrist will rule the entire world even though his headquarters will not be that far from Jerusalem at one point, but by then, the world will already have been divided up into ten sections and who will then give their authority to the beast, who will command total power over the world for a time, times, and half a time (3 1/2 years; the last portion of the coming Tribulation). What does Jonathan Cahn want? It seems he wants to warn believers that things can turn around, that the coming fall of all countries throughout the world that will make up the Revised Roman Empire can be thwarted if Christians will remove the idolatry from their lives and somehow get the rest of the people in the United States to do the same. I applaud the push to remove idols from the lives of each and every Christian. We need to be vigilant about ensuring that Jesus is always on the throne in our life and that nothing moves Him from that vaunted place. However, this is something that every Christian should practice daily and to expect pagan society to establish this same attitude is a complete waste of time. I suppose if everyone in America became an authentic Christian, totally sold out to placing themselves under the Lordship of Christ (not for salvation, but as a result of our salvation), then certainly, the fabric of society would change. But not even all true Christians do that, sadly. However, the most we can hope for is that more people will become authentic Christians, taking their relationship with Jesus seriously. But as we approach the end of this age, evil will become more prevalent and will eventually give birth to the perfect storm whereby Antichrist can rise to the top of the heap and wrest control from those ten kings referred to in Revelation 17. Dominionism is the belief that if Christians work hard enough to spread the Gospel and turn people to Jesus, a domino effect will occur throughout society that will change America into a nation that glorifies God. I don’t see this in Scripture at all. I see things getting worse and worse until the Tribulation occurs wreaking the worst persecution on earth that has ever been or will ever be. This will be “cut short” by the physical return of Jesus, who will then set up His Millennial Kingdom where He will rule with a rod of iron for 1,000 years. He will literally show the world how it is done. Our job as Christians is to shine forth the light of Christ within us, to fellowship with God, and to bring Him glory. We shouldn’t be worrying about “saving” America, because in the end, America won’t be around anyway. Certainly, it’s doubtful it will be here during the Millennium and it’s also likely it won’t be here in this current form during the coming Tribulation when Antichrist rules the world. Do you think God is lying about what’s coming? Or…maybe you think it’s not set in stone? Entry filed under: Atheism and religion, christianity, Cultural Marxism, Demonic, devil worship, dispensationalism, Emotional virtue, eternity, Global Elite, israel, Judaism, Maitreya, new age movement, Political Correctness, Politically Correct, Politics, rapture, Religious - Christian - End Times, Religious - Christian - Prophecy, Religious - Christian - Theology, salvation, second coming. Tags: dominionism, idolatry, idols, jonathan cahn, revised roman empire, the paradigm, tribulation. Author Dan Brown’s New Concept of God Isn’t New	Can Christians Take God’s Grace for Granted? What a great article! If more Christians could take hold of that approach and insight described here, and be more faithful to the scriptures than to prophets enticing to falsehood, they would be set for the better. Thank you, Daniel. May the Lotd be glorified through the article. laid this on his heart. He was truly a Godly man I have no doubt about that. Yes Lois, there are many “prophets” today who all claim to speak for God or have mysteries from God to reveal. You’re doing what’s best – following Jesus and Him only!